Throughout the day the auto-pilot will keep automatically selecting the next race that has been ticked. 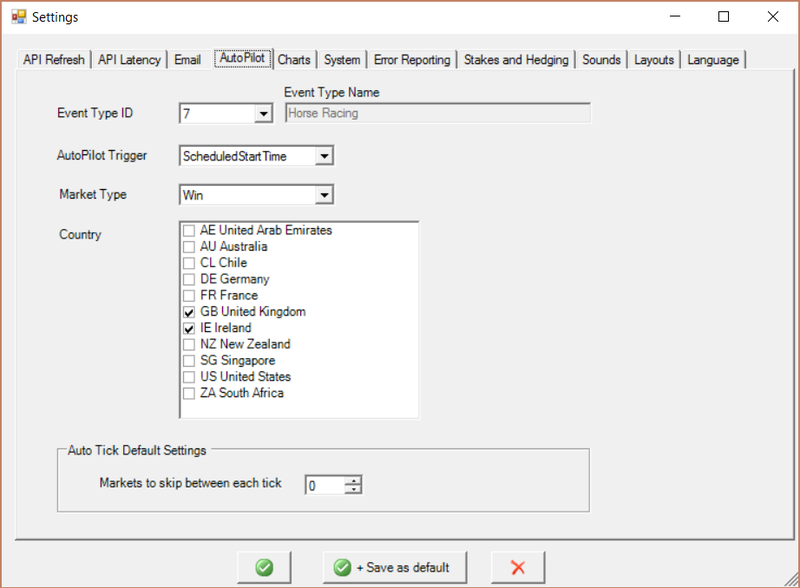 It can be configured to select the next race when the current race reaches its scheduled start time or at the end of each race (user configurable). The auto-pilot can be used on horse racing or greyhound racing only. Populate auto-pilot. Click this button to populate the auto-pilot (see below). Next Market. 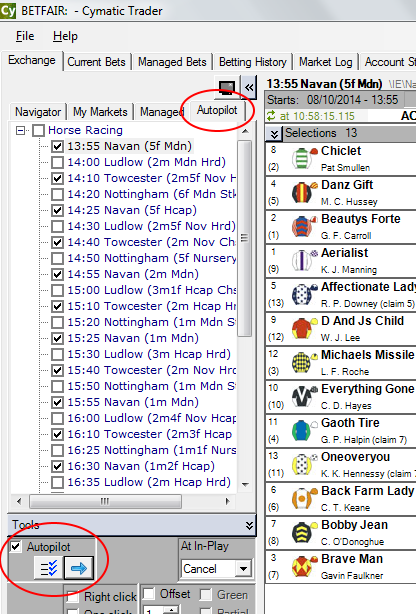 Click this button whenever you want to manually jump forward to the next ticked race. Activate auto-pilot. Put a check mark here to activate the auto-pilot it for the trading session. Click this button to open the the window shown below. This allows you to choose criteria to automatically populate the auto-pilot with a list of markets and put a check mark next to some of them. It provides a reliable and rapid way for you to automatically put a check mark next to a large number of markets, for example if you want to trade every other horse race for a certain day. Click OK to allow it to automatically populate the auto-pilot tab/page with a list of markets and put a check mark next to some of the markets for you. The markets with a check mark are used by the auto-pilot, in sequence. There are two event types that you can use with the autopilot. Determines when to automatically jump forward to the next race. ScheduledStartTime - jump forward as soon as the current race's scheduled start time arrives. EndOfInPlay - jump forward as soon as the current race finishes (at the end of in-play, when the race is suspended). 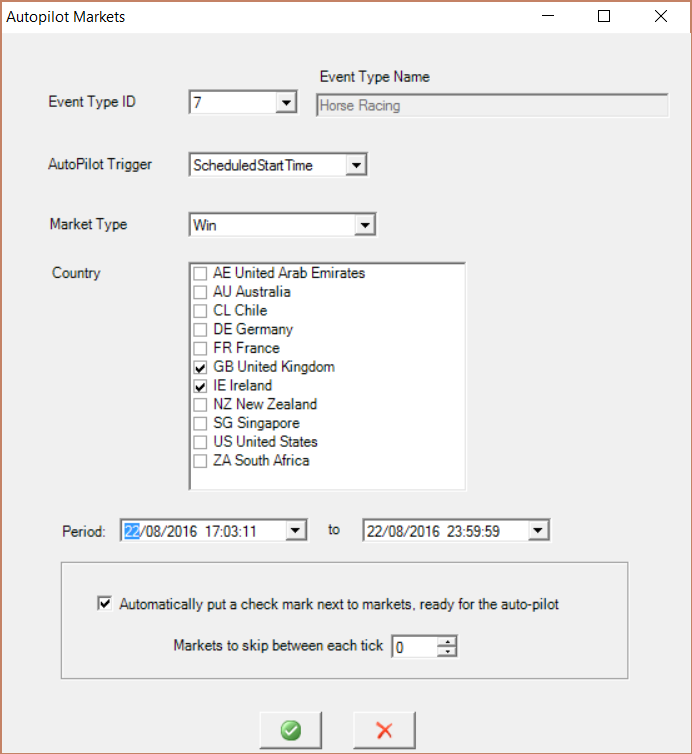 The auto-pilot can be used for events occuring in the countries shown: AE (United Arab Emirates), AU (Australia), CL (Chile), DE (Germany), FR (France), GB (United Kingdom), IE (Ireland), NZ (New Zealand), SG (Singapore), US (United States), ZA (South Africa). Useful if you are using multiple computers, each trading different markets, otherwise set it to 0 to not skip any markets. Also useful if you want to skip some markets when it is busy. For example if there are races every 5 minutes, but you just want to trade half of them, for 10 minutes each. 3 = tick one market, then skip the next 3, and keep repeating this tick pattern. The settings can be saved as default, using the settings in the main application window.